The month of October commemorates the 10-year anniversary of the county’s largest immigrant youth-led organization, United We Dream. In the past decade, United We Dream has accomplished things no other grass-root organization has been able to achieve before. Like starting as a small collective of undocumented people from seven states, communicating only through phone calls, to currently having close to half a million members that extend from 5 statewide branches to over 100 local groups across 28 states. “Even though we were small in numbers, I think just knowing that we had each other made such a huge difference,” United We Dream co-founder, Julieta Garibay said. In the ten years that United We Dream has been helping undocumented youth and their loved ones, one of the most culturally significant things they have accomplished is creating the Undocumented and Unafraid Campaign, which has helped millions of undocumented youth come out of the shadows and has helped gain the confidence and self-love to fight for their right to stay. “At first, we were scared, no one was talking or saying ‘undocumented and unafraid’,” Garibay recalls. Garibay, who was one of the original people who sat in those early national calls back in 2008, remembers a time where she felt ashamed of being undocumented. Having migrated to Texas when she was 12 years-old, Garibay says growing up there really wasn’t community amongst undocumented folks primarily due to the fact that keeping immigration status a secret was almost religion back in those days. Garibay says it wasn’t until early talks about the Dream Act began arising in 2001 that she and her sister decided to start one of the first groups of undocumented youth in Texas. Garibay says her desire to practice her passion for nursing is what motivated her to get involved and through her work with that organization she met Walter Barrientos, another of United We Dreams co-founders, in 2005 while co-presenting on the Dream Act at a conference. Their meeting resulted in what we call United We Dream today. “I realized it’s about fighting for our families, fighting for our own dignity, and no longer staying quiet. It’s been a lot of years, a lot of trials and errors, but i think that is the beauty of United We Dream,” Garibay stated. Under Trump’s America, Garibay says it’s important that United We Dream keep true to its values and continue giving undocumented youth the space to feel empowered and unashamed to fight for the dignity and rights of their families and communities. “The beauty and the power of United We Dream has always been that we are non-partisan. We will call you out when you are attacking our community, we will hold you accountable,” Garibay said. Greisa Martinez, United We Dream’s current deputy director, and long-time member, says that the best way for the undocumented community in this country to hold our politicians accountable is through civic engagement. 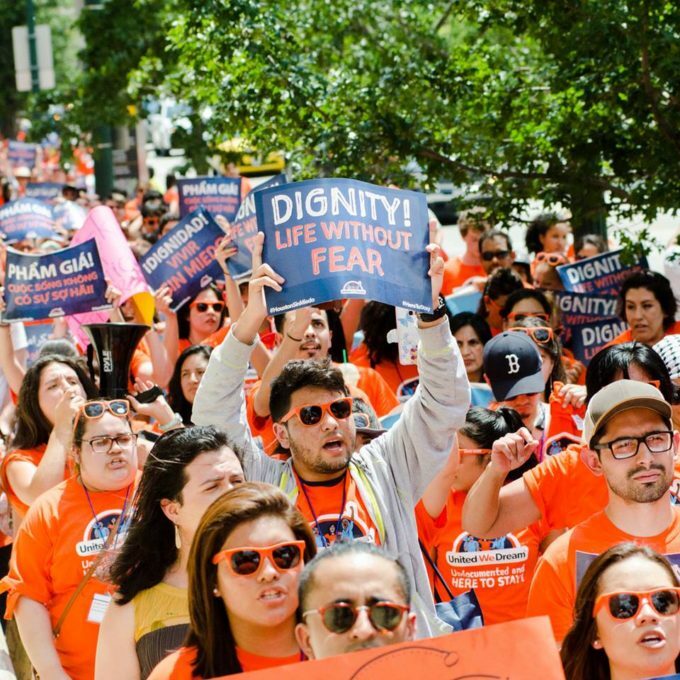 To accomplish this, United We Dream’s Live Unafraid campaign is embolding undocumented youth to make their voices heard at the polls this fall through door-to-door canvassing and phone banking across the nation. Since undocumented people can’t vote, the next big step is to push those who can vote, but don’t, out to the polls by taking the important issues facing their states and the undocumented communities living in them to their doorstep and phone. “Unless we build independent political power, where voters are committed to our vision, where we are able to build power that holds our politicians accountable, regardless of party, then we will not win the policies that will change the lives of our people,” Martinez stated. Martinez, who began her organizing career back in 2006 in Dallas, Texas while still in high school, says she has seen first hand the power engaging potential voters has in voter turnout. “It is important that we talk about the disenfranchisement of brown and black people in this country. That is why we are doing this and because this is the way we are going to win protections for our families,” Greis stated. Currently each of the five United We Dream branches is holding their own Live Unafraid campaign, each with their own state-specific platform. Here in New Mexico, the platform is focused on more education funding by the state and less dependence on the private detention sector for state income. “It was a dream, but we made it happen,”Garibay said, “When you see people canvassing, and realising that they have a voice, even if they are undocumented by talking to people who can vote to exercise their power has been life changing”. To join the Live Unafraid civic engagement campaign you can sign the pledge here. You can also text the words Live Unafraid to 877-877 to receive more information about UWD’s civic engagement campaign.